We are proud laser therapy has become a part of our post- surgical pain protocols, arthritic, wound care and treatment of many chronic inflammatory conditions. Continuing to be a leader in the use of new technology, Carlton Animal Clinic has recently acquired a new FDA approved Class IV Therapy Laser unit, manufactured specifically for use in companion animals. Widely used in human rehabilitation programs and by professional sports trainers, Class IV Laser Therapy alleviates pain, reduces inflammation and accelerates healing. Deep penetrating photons of light from the laser influence cell chemistry and metabolism in a variety of beneficial ways. Best of all, treatment with a Class IV Therapy Laser is completely painless. Laser therapy has become a part of our post- surgical pain protocols, wound care and treatment of many chronic inflammatory conditions. (Numerous acute and chronic conditions respond to treatment as pain and inflammation subsides, and healing occurs. Arthritic patients are also benefiting from this non-invasive approach that offers an alternative to drug regimens! Carlton Animal Clinic is proud to offer Class IV high intensity laser therapy. Lasers are not new. Class III therapy lasers were first approved by the FDA in the United States in 2002. Class IV lasers were recently approved by the FDA in 2005, but have been used in Europe for much longer. Acceptance has been rapid in human rehabilitation and is slowly on the rise in veterinary medicine. Class IV laser therapy uses of an intense beam of laser light photons to penetrate into tissues to reduce pain, increase blood flow, promote healing and decrease inflammation. This process is called photobiostimulation, whereby photons of laser light at specific wavelengths penetrate the individual cells and stimulate both the cell membrane and structures within the cells. The photons stimulate the mitochondria of the cells to increase production of energy for the cell in addition to the normalization of the cell function, pain relief and healing. 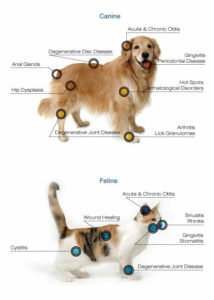 No matter what size dog or cat you have, laser therapy can be part of the solution to help ease your pet’s pain. Safe and effective, this powerful modality provides increased mobility, increased wound healing, bactericidal activity and post- surgery rehabilitation. No sedation is required and the experience is usually pleasant and comforting to the animal. Pets do not need to have their hair clipped either. Although improvement is often seen after the first visit, most patients require several treatments (3 to 9) for greatest benefit. For most conditions, we recommend a multi-visit treatment plan. Treatments vary in length, but most sites require 2 to 8 minutes. A majority of patients (we estimate 85-90% show improvement) exhibit greater comfort and mobility within 12 to 24 hours after a laser treatment, particularly after several sessions have been done in chronic conditions. Class IV laser therapy treatments are cumulative in nature. Therefore each additional treatment continues to improve your pet’s condition. The length and frequency of treatments varies with your pet’s condition. We will recommend a treatment plan specific to your pet’s condition after a consultation and physical examination. The cost of most treatments is $30-40, with discounted multi treatment packages available. Typically, this includes up to 3 joints being treated on each visit. (Example: both hips and spine). Faster Wound Healing. Laser light stimulates fibroblast development (fibroblasts are the building blocks of collagen, which is predominant in wound healing) in damaged tissue. Collagen is the essential protein required to replace old tissue or to repair tissue injuries. 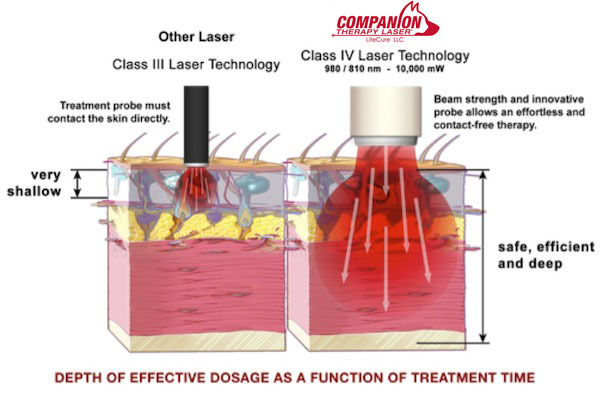 As a result, laser therapy is effective on open wounds and burns. Anti-Inflammation. Laser light therapy has an anti-endemic effect as it causes vasodilation, but also because it activates the lymphatic drainage system [drains swollen areas]. As a result, there is a reduction in swelling caused by bruising or inflammation. Anti-Pain [Analgesic]. Laser therapy has a high beneficial effect on nerve cells which block pain transmitted by these cells to the brain and which decreases nerve sensitivity. Also, due to less inflammation, there is less edema and less pain. Another pain blocking mechanism involves the production of high levels of pain killing chemicals such as endorphins from the brain. Immunoregulation. Laser light has a direct effect on immune status by stimulation of immunoglobulins and lymphocytes. Laser therapy is absorbed by chromosomes that react to laser light. The enzyme flavomononucleotide is activated and starts the production of ATP [adenosine-tri-phosphate], which is the major carrier of cell energy and the energy source for all chemical reactions in the cells. Trigger Points and Acupuncture Points. Laser therapy stimulates muscle trigger points and acupuncture points on a non- invasive basis providing musculoskeletal pain relief.